When I started this site in April 2012, I also started tracking my net worth in a Google spreadsheet. Now I use Personal Capital to track my 6 investment accounts (spread across the TSP, Vanguard, and Betterment) but still use a spreadsheet to aggregate all my financial data. For the past 3.5 years I make monthly updates on my assets (cash, emergency fund, investments, real estate, and automobile) and my liabilities (credit cards, student loans, mortgage, and auto loan) to calculate my total net worth. The spreadsheet has been a great way to see how automatic saving, investing, and debt repayment can add up quickly over time. In just 5 years since graduating my wife and I have risen from a -$100,000 net worth to a positive six figure. The spreadsheet has also been useful to track my goal of having no debt by the time I'm 30. $20,000 Sallie Mae student loan at 1.75%. Over $66,000 in debt and I only made $27,000 in 2010 according to my tax return. Over a third of my monthly income was going towards debt repayment. It was a painful situation and we never felt like we were getting ahead. Alternatively, my wife graduated in 2009 with $45,000 of 0% interest student loan debt. Other countries have figured out much better solutions to student loans then the United States. Before we got married, she saved 80% of her income for a year and paid off 90% of her debt. The remaining 10% we paid off within a year after getting married. 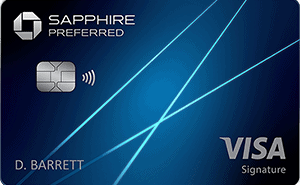 The debt holder even let us pay it off with a credit card, meaning we met the spending minimums on a Chase Sapphire Preferred card with just one purchase. We made over $500 in Chase Ultimate Reward points just by paying off her loans! The chart below starts in April 2012, when I started Military Money Manual. Each data point is the first of the month and shows how we slowly paid off our debts over the years until we were able to make one large final payment. The dip between January 2013 and July 2013 is from a two month deployment where I paid off my USAA Career Starter Loan two years early. 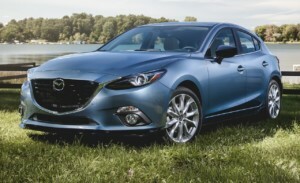 The big jump in debt just before January 2015 is when we purchased our 2015 Mazda 3. We got a great deal on the car (by negotiating through emails) and a low interest rate (1.29%). 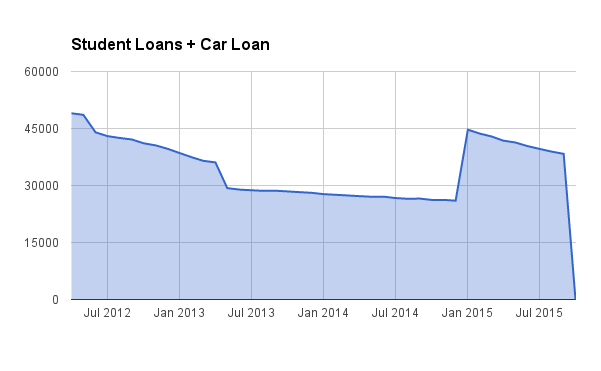 Because our car savings were invested in the SDP, we decided to just take on the loan at 1.29% interest rather than lose out on a guaranteed 10% ROI. The last data point in the graph is October 2015, when we closed on our condo in the Pacific Northwest. The proceeds from the sale of our PNW condo paid off my remaining student loans and our auto loan. In October 2015, we completed a cross country PCS road trip from the PNW to the East coast. It's awesome starting out a new assignment debt free. Plus, we're in a much more expensive area of the country, as evidenced by the fact my BAH went up by 20%. It was actually pretty anticlimactic to pay off the loans. I knew that the debt would be paid off early ever since I started repaying it back in 2010. The repayment math just doesn't change (no matter how much you want it to). The biggest decision we had to make was whether to invest the capital gains from selling our condo or paying off the rest of our debt. We decided to pay off the rest of the debt and invest the monthly savings from not making loan repayments. The best feeling came from the Sallie Mae (Navient) loans, as they were a weight around my neck ever since graduating university 5 years ago. It feels good now not having a “auto loan” or “student loan” line item in our budget. 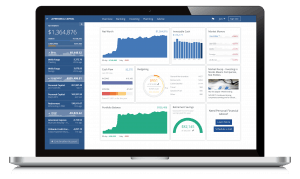 More than a good feeling though is now we can now put an extra $1080/month into our taxable investment account at Betterment. We've finally reached a 50% savings rate which means financial independence seems like a much more attainable goal now. Rather than celebrating paying off $100,000 in student loans, it would feel even better now celebrating being $100,000 richer. We would be much closer to our goal of FI by 40 if instead of spending the last 5 years paying off my student loans we had been investing that money all along. My advice to you youngsters out there: no more than $10,000 in student loans, unless you have a very high paying job (medical, petroleum, engineering) lined up. 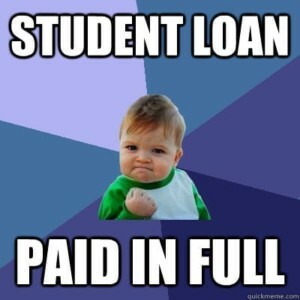 Even then, find a way to keep your costs down and don't just accept high amount of student loans! There are always cheaper ways to go to school. There's no magic tricks here. Just a few basic principles, some patience, and 5 years of time. Besides the investment return from selling our condo, anyone could do all of these steps. Even without the windfall payment we were probably no more than 2 years away from paying off all of our debt, still achieving our goal of debt freedom before I turned 30. Military servicemembers have a lot of options for student loan repayment plans. Government issued loans can usually defer payments while you are on active duty. If you have privately issued loans, you may be able to apply Servicemembers Civil Relief Act or SCRA benefits to the loan and cap the interest at 6%. Refinancing your student loans to a lower interest rate saves you interest and can lower your monthly payment, allowing you to throw more of your income at your debt. Just before I graduated university I paid off a $15,000 DirectEd government student loan at 6.8% with my USAA Career Starter Loan at 2.99%. You could also lower your monthly payments by calling your creditors or using a debt refinancing service like SoFi. Don't be afraid of an adjustable rate loan refinance. If you make paying off your debt your priority, you should be able to pay off the loan well before it matures and you should not have to worry too much about the rate adjusting. Take advantage of the low interest rate environment that we currently live in. Keeping your expenses low and continuing to live like a college student after you graduate is one of the most important steps in paying down large debts. If your expenses take up most of your income, you won't have extra cash to throw every month at your debt problem. My wife was able to apply 80% of her income for a year towards her student loans because she moved back in with her parents for a year. Use your resources and your network of friends and family to keep your costs down. Maybe take in a roommate to help reduce your rent costs or keep driving your old car rather than getting a new one. I drove a 2004 Saturn L300 for 3 years before it drove me crazy. My wife and I still keep our entertainment expenses down to $100/week. Instead of renting a home at or above our BAH, we found a great 2 bedroom place that's $1000 under our BAH, allowing us to invest that extra money. I bring my lunch to work 4 days a week and we only eat out once or twice a week. These are just some examples of avoiding increasing your expenses just because your income goes up. You shouldn't see every pay increase as an excuse to spend more money: you should see it as an opportunity to reach financial independence faster. When I deployed we rented our home out on AirBnB. Even when we were home we often rented our couch out. It was a good way to make money without much extra work from us. I also started this blog which has generated over $10,000 in additional income in the past three years. While this isn't a great hourly rate, it's a fun hobby for me and helps me think about my investment goals and share what I've learned about military financial topics with other servicemembers. One of the most popular debt repayment plans is Dave Ramsey's Debt Snowball. Dave advocates paying down your smallest debt first and then applying that amount as an additional payment to your next smallest debt. This is a fine repayment scheme as it gives you the psychological reward of knocking out debts quickly. However, the more mathematically correct way to repay debt is to focus all your extra payments on your highest interest rate debt first. This will result in the most savings by eliminating the highest interest rate debt first. Some people call this the “Debt Avalanche.” Another technique is to focus on the loan that has the largest monthly required payment. Once that loan is paid off, this gives you more breathing room in your monthly cash flow. Whatever method you like, just pick one and stick with it until your debt is paid off. 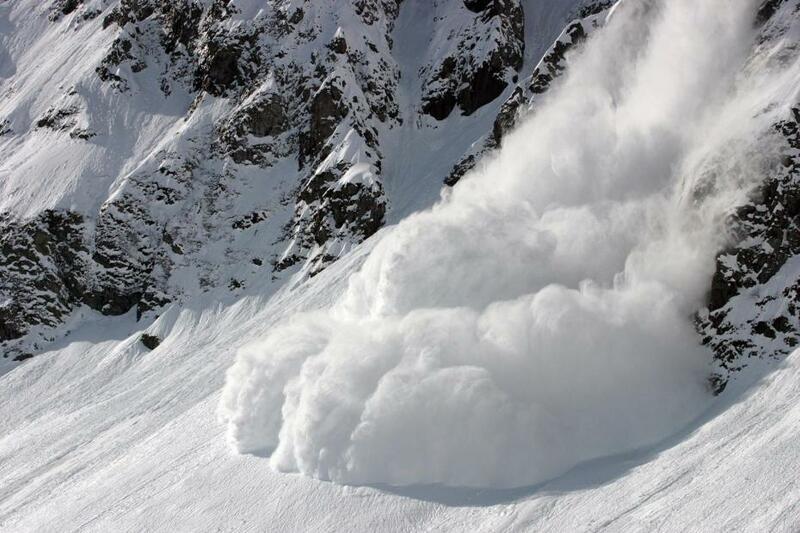 I chose the debt avalanche approach. My highest interest rate debt was the USAA Career Starter Loan, so I made double payments towards it until I paid it off two years early. After that, I focused on building my TSP and Roth IRA portfolios for a few years before applying the final payments to all my loans. The required minimums payments for my Navient Loans were only $220/month and were less than 2% interest on both of them. I figured I could get a better return in the market. Once I had the stack of cash from selling the condo though, I knew it was time to be done with the loans once and for all. Just like you should automate your investments so you never have to make a choice every month whether or not to invest, you should also automate your loan repayment. Many companies have automated loan repayment systems on their websites and some even give you a discount for signing up for automatic repayments (usually a .25% interest reduction or similar). If the company you owe money to doesn't have an automatic system, most banks and credit unions have automatic bill pay systems that will electronically transfer or send a physical check every month to your lender. In my job I'm often picking up extra cash from going TDY or getting tax free income from being deployed to a combat zone. We also make extra money from AirBnB and this website. Every time we got a little bit extra, I would put at least 50% of my extra income towards a financial goal, whether it was investing for financial independence or paying down my student loans. The other 50% I wouldn't feel guilty about spending or saving for a bigger purchase or vacation because I know 50% of my income is already going towards my financial independence goal. When we sold our condo, we had a big decision to make: pay off the remainder of my student loans and auto loan or invest the cash in a taxable investment account. We chose to put this windfall towards being debt free before we turned 30. Putting little bits of extra cash towards your debt repayment can cut months or years off of your repayment schedule. Using large windfalls to pay off your debt can mean being debt free when you're 28 or still paying your loans off when you're 40. Becoming debt free is only one of many mileposts along our journey to financial independence by age 40. It took us 4 years to reach the first $100,000 in net worth but we'll get the second $100k in only 17 months. Hopefully the next $100k comes even faster. Without monthly debt payments, we're now finally able to automatically save 50% of my after-tax military income ($18,000 into TSP, $11,000 into IRAs, and $13,000 into a Betterment taxable investment accounts). We're on track now for a $1,000,000 net worth by age 38. We're taking a trip to Patagonia next year and hope to have many more adventures before we reach financial independence. Just because we're investing 50% of my income doesn't mean there isn't time or money to enjoy the better things in life. It's all about priorities. Even with debt freedom, it is still important to avoid lifestyle inflation. I hope we can keep inching our savings rate up even more as our income naturally increases with promotions and time in service pay increases. Then we can reach financial independence even faster. Have you paid off a large debt? Do you have any tips for everyone else? What do you think about student loans? Do you think they are acceptable to achieve a college degree or should college students attend cheaper schools or get more scholarships? Great job! I was a little confused about the career starter loan until I saw your explanation. You’ve done an amazing job.